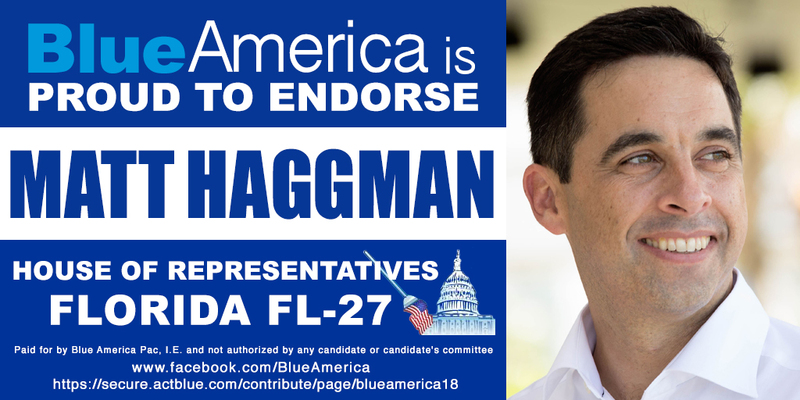 I want to introduce Blue America's newest endorsed candidate, Matt Haggman in Miami-Dade, the 27th district, from which Ileana Ros-Lehtinen is retiring. The only reason this very blue seat has remained in Republican hands for so long is because Debbie Wasserman Schultz has done everything in her once- considerable power to undermine and sabotage any Democrat who has gone up against Ros-Lehtinen, an old crony of hers from when they both served in the Florida state legislature and worked together to gerrymander the state in a way that helped the GOP and, of course, Wasserman Schultz. She's now a largely reviled and powerless character and Ros-Lehtinen realized without Debbie working for her behind the scenes-- Debbie's no longer even allowed behind the scenes-- she'd better retire with grace. The district has a PVI of R+5 and Hillary beat Trump there 58.5% to 38.9%, the biggest, bluest margin in any Republican-held district in the entire country. This cycle, predictably, a boatload of Democrats jumped into the race. 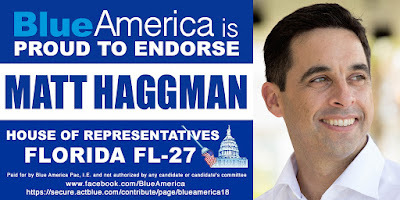 Since then many of them dropped out, leaving it a contest basically between progressive Matt Haggman and two garden variety Democrats, Clinton-era throwback Donna Shalala and moderate state legislator David Richardson. All have raised approximately the same out of money. Shalala and Richardson, though, are both self-funders who each dropped over half a million dollars of their own money into their campaigns. Yep... seat buyers. Clearly the best of the three candidates, I asked Matt to introduce himself to DWT readers with a guest post. 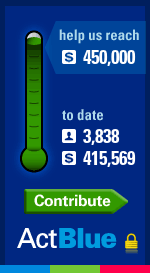 If you like what he has to say, please consider contributing to his campaign-- by clicking on the Blue America 2018 congressional thermometer on the right. I’ve never run for elected office before. But last year I decided to quit my job and run for Congress. Before the last presidential election I believed America would never elect a person who said and did the things that Donald Trump said and did. I believed America today would never elect a bully, a liar, someone who preyed upon our worst fears and sought to divide us to win. We might come close to electing such a demagogue as president, but at this stage in our country’s history we would never actually do it. We had come too far to take such a clear and destructive step backward. America today was, I thought, different. I was obviously wrong. Eight years after the most hopeful moment in our politics in my lifetime, we now were at the very bleakest moment. The better angels of our nature had given way to the most base sensibilities. A presidency built on hope had been followed by one built on our worst fears. How we respond is, of course, critical. Years from now we will each be asked, what did you do when a president was elected who declared the press the enemy of the state, instituted a Muslim ban, ripped immigrant children away from their parents? Each of us is answering that question in our own way. For me, I’m answering by running. But I would argue even more is at stake than standing up against a rogue and duplicitous president. To me, what is required in Congress today is dramatic overhaul. Not incremental tweaks but deep and widespread change. This needs to be more than simply retaking the House but a moment of renewal in our politics in which we chart an entirely new path, and practice our politics in entirely new ways. Even as Donald Trump’s election was a call to action and even as we must ensure that Trump’s America doesn’t become the new normal, Trump’s election revealed something else. Namely, it revealed that our political system is badly broken. For years our politics have been stuck. Friends intent on driving social change have long given up on politics as the place to do it. They’ve focused their efforts in community activism, entrepreneurship, arts, education (my brother has worked as an 8th grade public school teacher the past decade), rather than try to make a dent in the messy and ineffective world of politics. Trump’s election served notice that the rupture is complete. Something is deeply wrong with our entire political system. Indeed, the sad truth is that while Trump is a cause of our political dysfunction, he is also a symptom of it. At the time of Trump’s election I was Miami Program Director at the John S. and James L. Knight Foundation. Before that I was a journalist for almost a decade, most of that time at the Miami Herald. During my nearly six years at Knight Foundation I launched an effort focused on propelling Miami’s entrepreneurs and civic innovators as a way to expand opportunity and drive community engagement. The effort resulted in thousands of jobs, spawned myriad new leaders and, most important to me, created a new sense of possibility in Miami. We aimed to lift up the entire community, supporting the launch of dozens of programs ranging from The Idea Center at Miami Dade College, supporting student entrepreneurs at the largest and most diverse college in the U.S., to the creation of the Black Tech Week and Women Innovating Now LAB Miami, supporting black and women founders. As I’ve set out on my first campaign-- building a plane while flying it, I’ve often described it-- much has shaped my thinking. From growing up in Cambridge, Mass. in Speaker Tip O’Neill’s district, being a product of public schools, attending college in New Orleans at Tulane University, working as a journalist at the Miami Herald. But what I want to focus on here is the work at Knight Foundation helping propel entrepreneurs, small business owners and community leaders in neighborhoods across Miami. At its core, that work focused on investing in and empowering people, helping entrepreneurs honestly assess challenges and think in new ways to solve them, while building trust and establishing core values across the community. 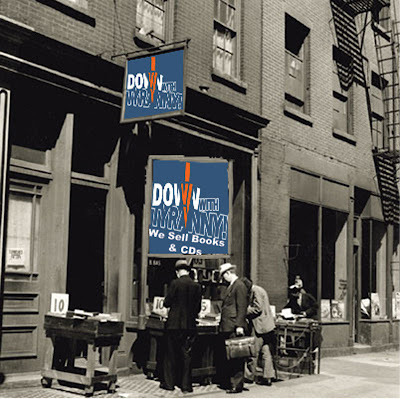 And, most of all, the work thrived on an ethos of helping people disrupt-- in big, transformative ways-- the normal way of doing things. To me, all of this is required in our politics today. We need wrenching, system-wide change. And we, as candidates, can’t just aspire to it, but have the courage to live it. It’s for that reason that my campaign is refusing to accept any donations from political action committees, federal lobbyists or special interests that often play an outsized role in Florida politics like the sugar and energy industry. Instead, our mantra is people, not PACs. My belief is that if we can get people elected who are funded purely by individuals, then it’s one step closer to getting a Congress that is working in the public interest rather than the corporate or special interest. Consider that polls show that more than 80 percent of Americans-- more than 8 in 10-- want universal background checks for gun sales. Yet, there is zero movement on legislation in Congress to establish universal background checks. To me, there is one explanation: how congressional campaigns are funded. Once in Congress, I would support legislation banning contributions from PACs and lobbyists. Furthermore, support legislation that increases transparency on political contributions of all kinds and begin the process of passing a constitutional amendment to overturn Citizens United. But, to me, the key is not to wait. For too long we have seen well-meaning candidates who say we must have campaign finance reform but become beholden to the very system they pledge to change. Meanwhile, this needs to be a moment when we not only change the way we fund elections, but have the courage to let new leaders emerge from the bottom ranks of Congress to the very top. Now, more than ever, we need new leaders and fresh voices. But solely electing a host of fresh-faced members to Congress this Fall is not nearly enough. My response was not meant to detract from the years of great service Leader Pelosi has given to the party. She is a trailblazer who is responsible for some of the biggest successes of the Democratic Party in the past fifteen years. Experience and institutional knowledge are, of course, important. But if the Democratic party doesn’t see voters’ frustration with both its current leadership and our politics today, we will have missed an historic opportunity to chart a new path at a pivotal moment. If elected, I would also push for reforms that allow members of Congress to move up the ranks quicker. For instance, establish term limits for committee leadership posts. With this change, members will be able to move into leadership roles faster and groom future speakers. In sum, the “Blue Wave” must not only result in a Democratic majority in Congress, but new leaders at all levels too. If it doesn’t, my hunch is that this surge could ultimately resemble the last Democratic wave in Congress, which was short-lived and unsustainable. Yet, this is just the start of the broad change that is needed. We need to move away from the campaign formula that candidates are told to follow. Namely, focusing on a specific set of Democratic voters, sticking to selected Democratic poll-tested issues, and then spending most of our waking hours raising money. Back in 2012, when my Knight Foundation colleague Ben Wirz and I first sketched out our plan to help build Miami’s startup and entrepreneurial community, we established principles to guide us. This was built on a model of constant community engagement. Every other week we held a coffee open to the entire community. Anyone could come (we didn’t extend invitations or decide who could attend) and conversations were purposefully open-ended with nothing off limits for discussion. The result was a regular platform for people to share ideas, aspirations, complaints, fears-- whatever. Our thinking was that we didn’t have the best ideas, the community did. Furthermore, the best solutions are reached when you listen and have the courage to embrace good ideas no matter where they arise. And that the greatest impact is achieved when the most diverse range of people are included-- after all, innovation is built on a diverse range of people and ideas connecting and colliding. Thinking back on it now, I see how different it is from how we are told to run for political office. Rather than opening ourselves up to as many people possible, we choose to connect with a select few who regularly vote. Rather than being open to myriad ideas and solutions, we read from poll-tested position papers. Rather than seeing diversity and inclusion as a critical value, it’s viewed as a nice thing. For our campaign, our approach is to start with the voter and work backwards. We’ve built a campaign fellows program powered by more than 60 people who, along with me, are visiting voters in all 245 precincts across Florida’s District 27. Currently, we have hit 220. We’ve hosted meetups and coffees open to all. We also have tried an online site called UpVote where we ask people to identify what solutions they prefer. This is only a start. I know that listening, or even changing one’s mind after hearing a better idea, rather than presenting one’s self as having bold ideas and clear convictions isn’t typically rewarded in today’s politics. But we should start to try. Change occurs from the bottom up. Washington has not been able to find the solutions to our most pressing problems, listening more closely and more widely across our neighborhoods may prove better. My approach at Knight in supporting entrepreneurs wasn’t to make direct investment in businesses. Instead, it was to create an ecosystem of resources across the community that people could choose from to better build the ideas and solve the problem most important to them. This included programs that provided mentorship, connection, learning, access to funding, and fostered a greater sense of community. Examples include Endeavor, a non-profit which provides mentorship and support to help entrepreneurs scale ventures. eMerge Americas, an annual conference in Miami uniting entrepreneurs across the Americas. LaunchCode and Girls Who Code, each making learning to code more accessible and, in the case of Girls Who Code, taking aim at the yawning gender gap in technology. Social Entrepreneurship Bootcamp and programs, which I mentioned earlier, like The Idea Center at Miami Dade College, Black Tech Week, Women Innovating Now LAB, with a particular focus on black, Hispanic and women entrepreneurs. Our mantra was that talent is everywhere, but opportunity is not-- and that must be changed. Creating a network of resources that invest in people across the community from the bottom up was our way to try. It’s time our politics took the same approach. And, while at it, it’s time to start matching the scale of the challenges we face with the size of the solutions. For too long, we’ve operated under the assumption there are things we cannot do. That needs to end. I mentioned earlier that years from now we will each be asked what we did in response to a destructive and irresponsible Trump presidency. But an equally important question is, what did you at a time when the opportunity and income gap is wider than it’s been since the great depression; when getting an education resulted in so many going deeply into crippling debt; when we seemed helpless to confront gun violence; when quality, affordable healthcare remains a challenge for way too many families and prescription drugs remain artificially and cruelly high; when the planet continues to warm and sea levels rise; when entrepreneurship and business creation remain at decade lows; when the era of mass incarceration continues unabated; when public transportation remains abysmal for too many here in South Florida who lose hours each day commuting to work or school; and when there is such deep-seated mistrust in our politics. It's a long list. But that’s why we need a new approach which is both honest about what is required and unafraid to embrace solutions that actually have a shot at solving the problem. That’s why I am for Medicare for All, importation of prescription drugs and allowing Medicare to negotiate reasonable drug prices, universal pre-K, refocusing on improving public education, free tuition in community colleges and public universities, high-speed internet into every home, revamping our criminal justice system, raising the minimum wage to $15, increasing federal funding for public transportation, piloting a federal jobs guarantee. Taken together, this would begin to address the searing the opportunity gap in our country, while expanding opportunity and stirring job creation. Not only that, hastening the transition to an economy powered renewable energy. Indeed, my moonshot goal is for South Florida-- a region threatened by sea level rise-- is to be the first metropolitan area to do it. We are a long, long way from there today. But if we can muster the resolve, this is a change that will not only safeguard the environment and make us more resilient, but increase jobs and drive our economy. Meanwhile, we must get back to celebrating that we are-- and always will be-- a nation of immigrants. My wife’s family came to this country in 1966 from Cuba. They found a country that welcomed them with open arms and gave them a shot. We need to get back to being that America. Comprehensive immigration reform includes a pathway citizenship for the undocumented, fighting for Dreamers and those with Temporary Protect Status, cleaning up a cumbersome visa process, and abolishing ICE. Lastly, no one will believe Congress is really serious about change until we pass gun safety reform. This includes universal background checks, an assault weapons ban and a ban on high capacity magazines, among other changes. This is a tall order. But the truth is that we are at a crossroads. We need a new direction in our politics focused on solving problems with an open mind that is grounded in common sense, champions our diversity and engages the entire community. The response must allow for experimentation and cannot be top down. But it also can’t be incremental. To do it, in my view, we will need many new leaders in our politics. We can’t expect the same approach and the same people to deliver a different result. In President Obama’s farewell address he warned that we can’t take democracy for granted. It “falls on each of us to be anxious, jealous guardians of our democracy,” he said. What the speech said to me is that, yes, America is a special place-- but it is special because generation after generation have continually stepped up and engaged in making it so even as there are setbacks, sometimes dramatic setbacks, along the way. Now is that time for us. yep. one word to trump all your "inspiring" candidates. pelo$i. I win. we all lose.